Forget college football Saturday. October 12 is all about Ironman, at least if you’re an endurance athlete…or know one. The best of triathlon’s best are in Kailua-Kona, Hawaii, for the 2013 GoPro Ironman World Championship where professional triathletes and qualifying age-groupers will swim 2.4 miles from Dig Me Beach, bike 112 miles on the Queen K, and run 26.2 miles to finish on Ali'i Drive. You’re not thinking about your alma mater winning a football game (Go NU! ), you’re wondering who will be crowned Ironman World Champion, and you’re cheering for your friends, family, coaches and training buddies. I'm supposed to be gearing up for a Sunday marathon, yet I'm completely guilty of watching more videos, reading more tweets and staring at more paradise pictures about the Ironman than the Chicago Marathon. Maybe it's because I'm so used to running Chicago and my only chance of competing in Kona is to luck into a lottery slot (or hope that I have the race of my life and everyone else flops). All I know is that when the cannon goes off at 12 p.m. Chicago time, 7 a.m. Hawaii time, I'll be on my computer following some of these Ironman triathletes with Windy City connections. Thomas Gerlach. Gerlach is from Wisconsin and splits time between there and Tucson, but he's no stranger to Chicago. He racked up wins on the Chicago indoor triathlon circuit a few winters ago before he earned his pro card, and this year he nabbed his first Kona start as a professional. Andrew Starykowicz. Outside of Chicago, I'm willing to bet that not many people had heard of Starykowicz until last year when he won races, got stuck overseas after a race, and turned out a bike split worthy of a world record. I knew the name from years of perusing results from the Chicago Triathlon, where he went from age-grouper to pro. From Wauconda, Starykowicz shows that not all of the best pro triathletes live in Boulder. Mary Beth Ellis. This Northwestern alumna turned all of those long hours in the athletic center's pool into an Ironman profession. After winning several races in 2012 and 2013, Ellis could be World Champion except she broke her collarbone a few weeks ago, which might keep her off the podium. Jennifer Harrison. It was big day for Chicago-area triathletes at the Eagleman 70.3 back in June. Not only did Harrison, a triathlon coach, bank her Kona slot, but so did several other familiar names among the Chicago endurance circle. Harrison has been to Kona before, but it's been a few years. Older and wiser can be a good thing in Ironman. Ryan and Jacqui Giuliano. Forget gifting paper gifts for this couple's first anniversary--they're going for iron after punching their Kona tickets at Eagleman. I wish I had read the Giulianos' story on Jacqui's blog before this week to make more of a story out of it. It was Jacqui's idea to shoot for age-group wins at Eagleman when she noticed the World Championship would coincide with their one-year anniversary. This couple almost made that feat look easy--Ryan won his age group and Jacqui, who's won the Lakefront Marathon, ran her way to her AG win. Christian Waterstraat. Eagleman was also good to Waterstraat, who lost a Kona slot to Steve Johnson (below) last year. His wife, Elizabeth, earned one at the same race in 2011, and this year it's Christian's turn to run down Ali'i Drive. Just call them the original Iron couple. Steve Johnson. Johnson might be competing Sunday with a target on his back (better get out some camoflage, Steve!). He was the overall amateur champion at the Boulder 70.3 earlier this year, magically managed to race fast enough at Ironman Arizona last November to grab a Kona slot mere weeks after returning from the Big Island, and he's earned two umeke bowls since racing in 35-39. Amanda Wendorff. In her first Ironman, Wendorff's 10:45 wasn't good enough for a Kona slot. But a few months and another Ironman (New Zealand) later, and she got it. Wendorff is racking up impressive finishes this year at Ironman 70.3 Racine, USA Triathlon Nationals, and the 70.3 World Championship. Adam Zucco. This Training Bible coach is becoming a regular fixture in Kona with finishes from 2008 to 2012. But he almost didn't make it to this year's dance, which might be the most special for him because his dad, a 17-time Ironman finisher, was invited to participate too. Lauri Robinson. If you're afraid of getting slower as you age, just take a look at Robinson who's gotten faster. The 58-year old from Grayslake has raced eight Ironman races, and her last one in Wisconsin in September 2012, where she qualified for Kona, was one of her fastest. Others: Todd Byers, Julie Shelley, Matthew Ancona, Karen Grabowski, Bobbe Greenberg, Chantil Ruud, Miriam Cole, John Wiberg, Joel Zucco (Adam's dad). Michael Bond, Lynn Karner and Matthew Wade have raced plenty of Ironman events of the years, enough to qualify them for the legacy lottery. And this year, they lucked out and won slots to compete in the World Championship. Matthew Phillips, David Desser and Timothy Suter won their Kona slots through the Ironman lottery. They don't have ties to Chicago, but I can't help but want to follow Hines Ward and Gordon Ramsay. Ward, who is part of Team Refuel's Become One program, has transformed himself from a bigger, beefier football player into a leaner, meaner triathlon machine. I've been following his progress since he started training in February. As for Ramsay, I didn't realize he was competing (and somehow missed that he was at the 70.3 World Championship last month) until earlier this week. He already runs marathons, 15 at last count, so he should be in good shape for an event three times longer. 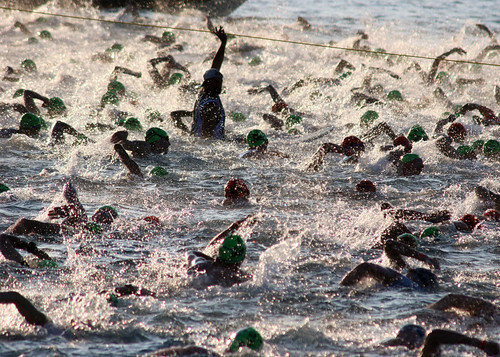 Who will you be tracking at tomorrow's Ironman World Championship? Photo grabbed from Marian Doss at flickr.